Congratulations! You win 37 bonus points with this purchase! Perfect product, just what I was getting at the opticians but 3 times the price there! Excellent service! I got them at home in three days!! I would recommend this product for people with astigmatism. I haven't rated 5/5 stars as there is always room for improvement with all products. I wish that they did my prescription in a daily lense - I would 100% purchase. I use this product most days , and it is of prefect quality . I've tryed many different contact lenses before. These are my favorite. I like their moisture balance. I have not tried the product yet as I have bought in advance. I would be happy to give feedback at a later date. I use the contact lenses everyday and I am very happy with the quality of it. I will recommend Lentiamo to all my friends, family members, work colleagues. 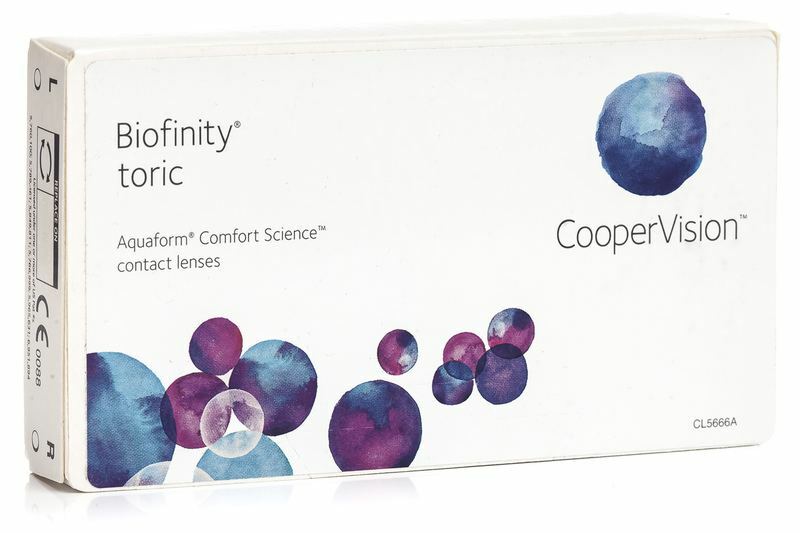 Biofinity Toric are silicone-hydrogel toric contact lenses, from CooperVision, that offer exceptional comfort, excellent vision and a healthier lens wearing experience. These soft, flexible lenses allow plenty of oxygen to pass through to the eye and support natural wettability with Aquaform® technology. Designed for daily use with a monthly change, Biofinity Toric contact lenses can also be worn continuously for seven days following the opticians' confirmation. Customers who bought these lenses also bought Biotrue Multi-Purpose 360 ml with case. Hi - my Cyl readings are -1.00 for my right eye and -0.25 for my left eye - these readings are not on your site. Do you do these readings? I am sorry, but I could not find any toric contacts in our e-shop with those cylinder parameters. Hy, how much a pair of lenses can be weard? It can be weard 24 h without taking it off for more than a couple if days? Hi, my old lenses have been discontinued and these are the recommended replacement. The old ones were 8.5 curve, and these are 8.7. What diff does that make to the prescription? Hi, For my right eyes my prescription is Sphere -0,50 cylinder -2,50 and axis 50. But I cant choose the right cylinder cause -2,50 doesnot exist. Do you know if any other Cylinder works? Hi, I am very sorry, but the lenses that we offer do not come in a cylinder with –2.50. Usually, it is –2.25 or –2.75. I am sorry about this. Hello, If you buy two boxes of 3 lenses they will last you for 3 months. One lens per eye lasts one month. Thank you! My prescription is biofinity toric in one eye but not in the other eye. Both are boifinity comfilcom A. How do I order? Hi. Can I get these in coloured? Lenses? Hi, No you are unable to get these lenses in coloured. Unfortunately, coloured lenses for toric lenses are not available with us. Thanks! They are just as comfortable as the Dailies I was wearing, so far delighted with them. I am going on holiday so need them to arrive urgently by Thurs 15th Aug at latest - Please let me know immediately if this will not be possible so that I can order elsewhere - many thanks. You can find out about availability by choosing required parameters.